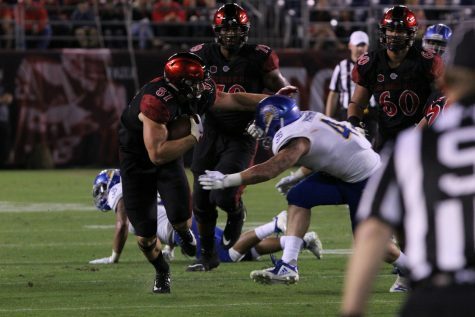 SDSU celebrates on the field following its 14-5 win over UNLV on May 26 at Tony Gwynn Stadium. 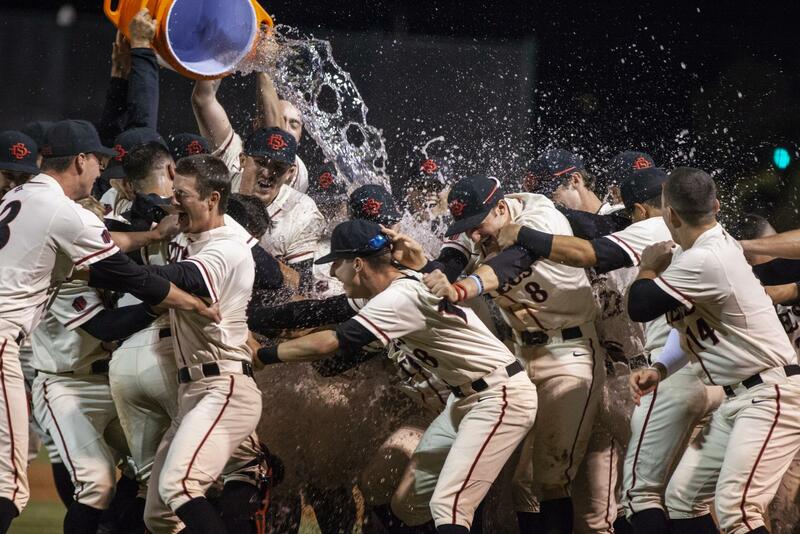 San Diego State baseball entered Saturday needing just one win to clinch a championship. 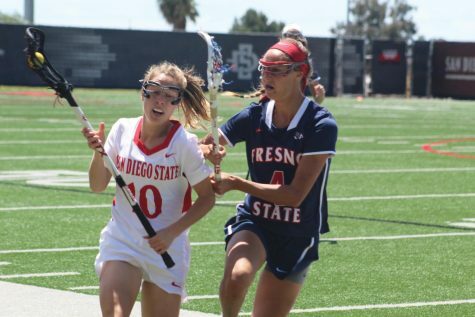 Undefeated through two Mountain West Conference tournament games, a loss would have forced SDSU to play a winner-take-all game against University of Nevada, Las Vegas on Sunday. 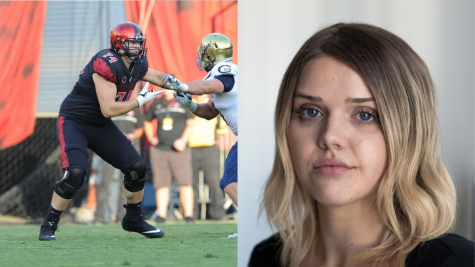 The Aztecs did not have to wait until tomorrow to celebrate. SDSU exploded for a five-run sixth inning to pull away from UNLV for the second time in as many nights, securing its fifth MW tournament championship in the past six years and dog piling on the field following a 14-5 victory on Saturday night at Tony Gwynn Stadium. 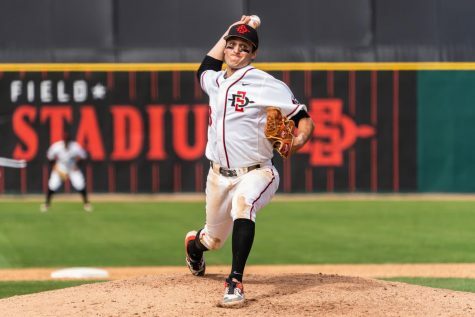 Senior pitcher Jacob Erickson closed out the game for the Aztecs, and was right in the middle of the celebration on the field after recording the final out. “My last time playing at Tony Gwynn Stadium, and just to dog pile on the mound with my team, my brothers, I wouldn’t have wanted it any other way,” Erickson said. 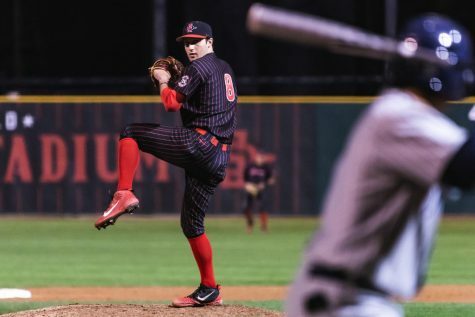 The Aztecs held a 6-5 advantage going into the bottom of the sixth inning, before six hits and a crucial passed-ball error by UNLV junior center fielder Kyle Isbel gave SDSU a commanding lead. 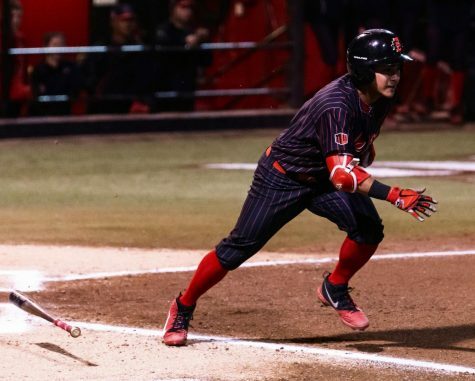 The big inning was part of a 18-hit night for SDSU, a tournament-high for the team which included multi-hit efforts from seven different players. Senior shortstop David Hensley and junior catcher Dean Nevarez led the way with three hits apiece, with Nevarez blasting a two-run second inning home run which got the scoring started. 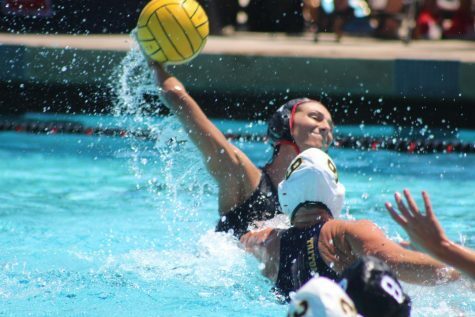 The Aztecs will be returning to the NCAA postseason tournament for the fifth straight year, and will look to improve on last year’s performance when they were eliminated by Long Beach State in the Long Beach Regional. SDSU got 4.2 innings out of senior starting pitcher Jorge Fernandez, who gave up four earned runs on six hits. Fernandez was relieved by sophomore pitcher Adrian Mardueno in the top of the fifth inning with a man on first base. Erickson came on in the fifth and pitched the final 3.2 innings, allowing only one hit to earn the victory. “We all believed, we just came, vibe was great all week in practice and something always special happens to us, so we really felt that going in,” Erickson said. 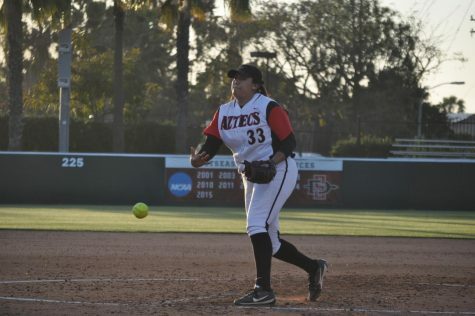 In addition to the five-run sixth, the Aztecs scored two runs in the second, four in the fourth, and two and one in the seventh and eighth innings, respectively. UNLV actually led 4-2 after a four-run fourth inning, which was highlighted by a two-RBI double from freshman first baseman Jack-Thomas Wold. SDSU answered with four runs of their own in the bottom of the fourth, which included a two-RBI double to left field by freshman third baseman Casey Schmitt, the eventual tournament Most Valuable Player. UNLV used a total of seven pitchers during the game, with none going longer than two innings after junior starting pitcher Paul Richy was pulled after two innings, allowing two runs on two hits.